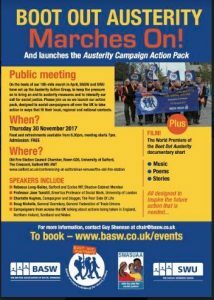 I am writing to invite you to the launch of the Austerity Campaign Action Pack, being developed by the Austerity Action Group formed by BASW following the Boot Out Austerity walk, with the support of the Social Workers Union. The flyer for the event is attached and I would be grateful if you could share this widely. It is taking place on the evening of Thursday 30th November, at the University of Salford. It is a free, UK-wide event at which we will be hearing of anti-austerit activity in Northern Ireland, Wales, Scotland and England. We are delighted that Rebecca Long-Bailey, a member of the Shadow Cabinet, will be speaking, alongside other notable speakers; and there will also be music, songs, poems, readings and film, in true Boot Out Austerity style. See the flyer for more details. Food and refreshments will also be served. You are receiving this email because of the interest you expressed in Boot Out Austerity. If you’d rather not receive future emails regarding BASW’s austerity campaigning, let me know by email, and I will remove your details from the mailing list. The British Association of Social Workers is a company limited by guarantee. Registered in England No. 982041.